First there was Facebook then came Twitter, and now there is a relatively new social networking service called Foursquare, which is gaining momentum both publicly and financially as users, investors, and marketers begin to realize its potential. Small business owners especially may have the 6 month loan to gain and some have even begun to capitalize on the opportunity. 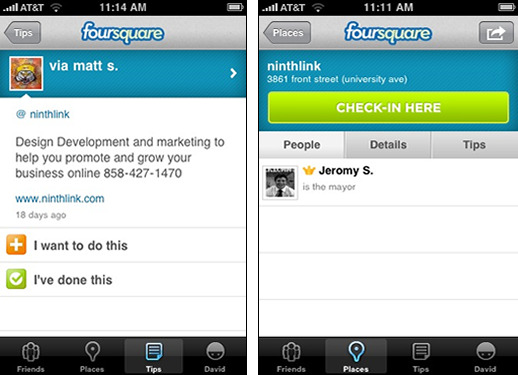 If you’re unfamiliar with Foursquare, it’s a location based application that allows users to broadcast their location to friends from their smart phone. However, location sharing is just the beginning… There is also an element of a game, where people compete against one another to become ‘the mayor’ of a particular business. One becomes the mayor by ‘checking-in’ at a certain locale the most. You get 1 point for each check-in and earn more points based on the number of places you check-in to on a given day, as well as for completing tips and to-dos posted by other users. The competition to become mayor of a specific locale is especially good for that particular business. You can read more on Foursquare here. Just recently, Foursquare raised an additional $20 million in venture capital, which brings the company’s value to around $95 million. Investors are confident mobile advertising will continue to grow as more and more people navigate towards smart phones. This trend, along with the service’s local focus could be extremely valuable for local businesses and advertisers to get their messages out, connect with customers and encourage repeat business through the game’s competition to become ‘mayor’. The Marsh Café, in San Francisco had put up a sign stating ‘Foursquare mayor drinks for free’. Not only did this marketing campaign garner attention from a multitude of media outlets, but the business also enjoyed increased traffic and has since hired extra staff and extended the hours of operation. Please share your thoughts about what you are doing to Promote and Grow your business online. Or ask our Ninthlink Pros how to help.